At a recent ceremony in Jakarta, Pingu’s English Indonesia announced another Pingu’s English School will open in Malang, East Java in April 2014, thanks to a franchise deal with PT. Gitajaya Sejahtera. Ms Eni Suhartini, the Director of PT. Gitajaya Sejahtera, is partnering with Pingu’s English in Indonesia because she believes that together they can provide quality English language learning for all children in Malang, East Java. This will be the ninth Pingu’s English School to open in Indonesia; and will start delivering English language training to young children across the city of Malang in April 2014. Now available in over 18 countries around the world, the Pingu’s English franchise is proving to be a fun, effective and rewarding experience for children across Indonesia too. Parents are seeing a marked improvement in their children’s confidence and English communication skills – a key objective of the Pingu’s English program. 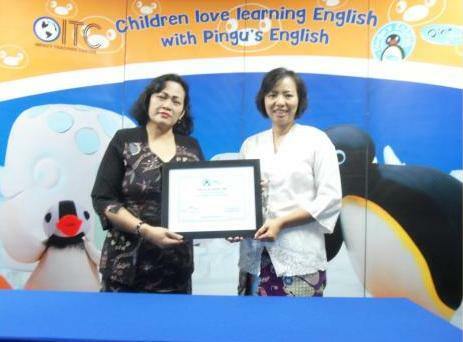 Ms Jenny Lee, Master Franchisee for Pingu’s English Indonesia welcomed PT. Gitajaya Sejahtera to the Indonesian network during the ceremony, and reinforced their confidence that by using the same key ingredients as the other Pingu’s English Schools in Indonesia, Pingu’s English Malang will be another success. Pingu’s English is a children’s English language course based on the popular HIT Entertainment children’s character, Pingu™. Transforming the way that young children learn English, their unique methodology uses a wide variety of imaginative activities and multimedia resources to teach children of 3-9 years the vital skill of communicating in English. Pingu’s English is published exclusively by the Linguaphone Group, a global language training provider from the UK. The Pingu brand is owned by HIT Entertainment, one of the world’s leading children’s entertainment producers and rights-owners.